KIEV, Ukraine -- Ukrainian Deputy Prime Minister Serhiy Tihipko has said that he is planning to attend an annual spring meeting of the International Monetary Fund (IMF) and the World Bank in Washington on April 24-25, 2010, and that he intends to discuss cooperation prospects with representatives of these organizations. "An IMF meeting will take place in Washington on April 25, and then we'll be able to agree all issues of concern," he told reporters in Kiev on Friday. 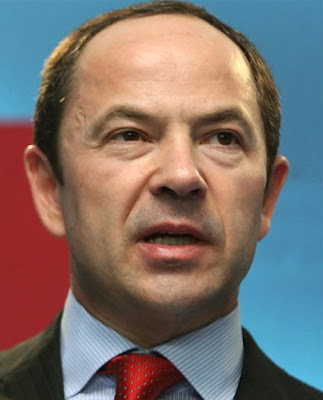 Tihipko said that after the departure on April 2 of the IMF mission, which worked in Kiev from March 24, the Ukrainian government would resolve for a fortnight the remaining outstanding issues, first and foremost, the issue of adopting the state budget for 2010. He said that talks with IMF experts would be held simultaneously. Tihipko expressed hope that a joint decision on a new program of cooperation between the IMF and Ukraine could taken rather quickly after the meeting in Washington in April. Ukrainian Prime Minister Mykola Azarov forecast on Friday that Ukraine's program of cooperation with the IMF could be resumed in May. The IMF, in turn, said in a press release on April 2 that the IMF mission had made notable progress in discussions with Ukraine, but pointed to a number of outstanding issues, notably with regard to fiscal policy, which have yet to be discussed. The IMF in autumn 2008 decided to disburse about $17 billion under the SBA. Since then, Ukraine has already received three tranches worth almost $11 billion. The allocation of the fourth tranche, worth $3.8 billion, was scheduled for November 2009 following the third review of the IMF's cooperation program with Ukraine. The IMF mission ended its work in Kiev late in October 2009, but did not issue a positive statement on the completion of the review. After the Ukrainian government received the third tranche, it also used about $2.1 billion through the conversion of Special Drawing Rights (SDR) allocated by the IMF as part of a general allocation of SDRs among all IMF member countries. IMF Managing Director Dominique Strauss-Kahn said on March 30, 2010 that he was rather optimistic that the IMF would resume cooperation with Ukraine, as the situation had changed over the last month.